It looks like 2016 is going to be an interesting year for display enthusiasts, with both LG and Samsung having some unique offerings this time around. Of course, while most people are likely more than happy with whatever setup they currently have for their PC, there’s always that update twinge that will affect some of us. Be warned, though: these are likely going to be very expensive items! This year, LG is planning to release a more cinematic ultra-wide monitor with a 38″ 3840×1600 screen. 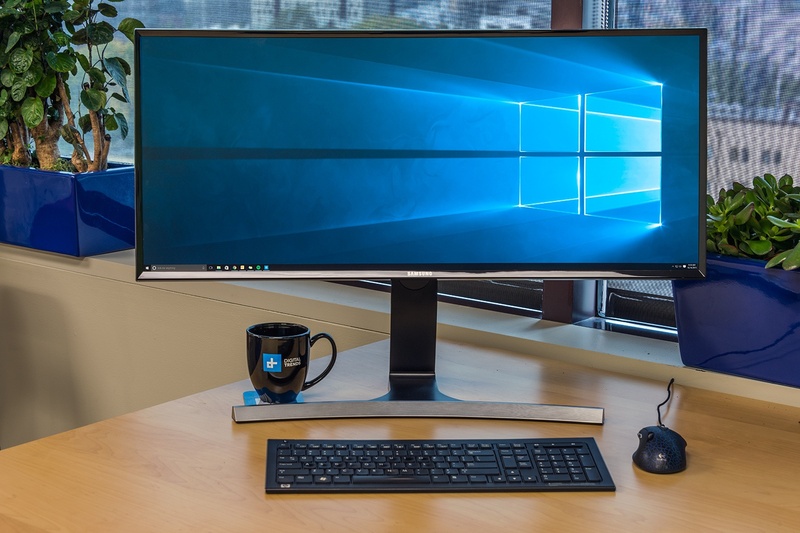 Their current ultra-wide offering tops out at 3440×1440, which is pretty close to 4K, but generally gets described as “Wide Quad HD” due to the 1440p vertical resolution. This newer screen would have a horizontal set-up on the order of 4K, but maintain a more accurate 2.4:1 aspect ratio that would be fantastic for viewing cinematic film (and still good for gaming, though the 14ms response time leaves something to be desired). And, if you’re into the ultra-wide market (which, again, is good for both productivity and gaming), Samsung will be introducing an ultra-ultra-wide screen with a 3840×1080 resolution, giving it a 32:9 aspect ratio. Technically, this makes them essentially two 1080p monitors combined and bezzleless, clocking in at either 41 or 49 inches, but what makes them more useful than having two 16:9 monitors is that you don’t have to do anything in terms of hardware of software to use this – it’ll (hopefully!) recognize right out of the box as being a single 3840×1080 display. Finally, Samsung is also bringing to market an 8K monitor (yes, 7680×4320 resolution!) that’s 32″ in size. What’s worth thinking about here is the fact that these are very much enthusiast-grade products. According to Steam, the vast majority of users use one of three resolutions: 1920×1080 (1080p), 1366×768 (a common laptop display resolution), and 1600×900 (smaller monitors, usually 20″ or so). The number of users using 1440p or 4K for gaming is exceptionally small, mainly because of the high cost of entry for buying displays of those types, not to mention the graphical hardware to drive them at acceptable framerates (especially for those wanting to try 120 or 144 Hz refresh rates). Furthermore, 8K seems far too high of a resolution for a 32″ display, and with display scaling being required to see any of the UI elements at that resolution, the only major benefit it would likely have would be in being able to properly edit 4K content (film, for example), while having a lot more items (tools, browsers, etc) open for your convenience. In other news, a PR contact of mine who works with Crucial sent me some products to review. 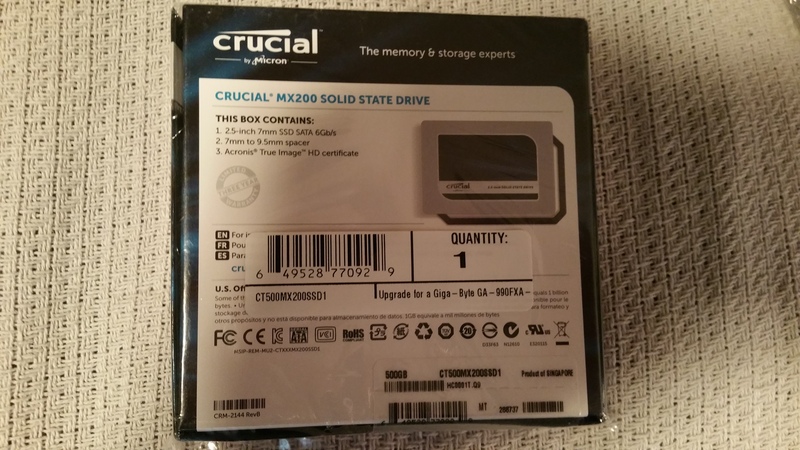 The main one of these will be the Crucial MX200 solid state drive (500 GB). As you might guess, my main desktop PC already has a SSD (the Samsung EVO II), so rather than shuffle around a bunch of files on the PC and potentially mess something up, my plan is to get this one plugged in as one of the secondary disks in the system and then put it to work as a high-end “scratch disk” that I’ll use for recording/encoding gameplay videos. This may seem like a wasted use, but if you know much about video recording and encoding, you know that one of the big bottlenecks ends up being disk read/write speeds. Without some trade-offs in quality, the more you push past 1080p60, the longer it’ll take to encode the video. Recording is very disk-intensive, so recording at resolutions higher than 1080p60 is very difficult. So, having a disk with higher writing abilities will then throw the bottleneck back on the CPU and GPU. Hopefully, by putting the MX200 to the test in this regard, we’ll get a solid idea of how it performs and what its optimal use-cases should be. They also provided some RAM, but unfortunately what they provided isn’t something that I can accurately test to any real degree. I may try to work out a return of it with them and get some more appropriate system RAM to try, but for now I think I’ll have enough on my plate putting this SSD to the test. Anyway, thanks for dropping into this week’s Tech Talk – hopefully you learned something interesting!